H.e.a.t. put out an incredible debut album in 2008 that surprised many AOR-junkies. The band sounded like the giants from the 80’s but was still a little different. They scored a huge hit with their Eurovision song contest single “1000 miles” in Scandinavia and the following album “Freedom Rock” received raving reviews and was nominated as one of the top 50 albums in 2010 by Classic Rock Magazine UK. But then fate struck the band and singer extraordinary Kenny Leckremo left the band. The future of the band was uncertain but they found a replacement in the person of Erik Grönwall. 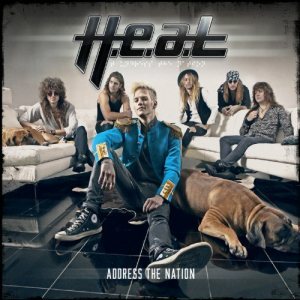 Now they release their third album “Address The Nation” with new label Earmusic (Edel). “Breaking The Silence” kicks off in a kind off Bon Jovi’s “Raise Your Hands” –way with massive arena chants. But the voice from Erik immediately adds a beam of power to the song. These Swedish youngsters have always said that they were hugely influenced and inspired by the 80’s AOR bands. That can be heard in their music, but also in the way they look and dress. Singer Erik is an exception of this house rule. With his looks you would think he’s the next Idol winner! But everyone knows he did win in fact the Swedish edition in 2009. He brought stunning versions of “Shout It Out Loud” from Kiss, “Run To The Hills” from Iron Maiden and “The Final Countdown” from Europe. When you look closely to the cover though you’ll see him wearing Converse All Stars and a vest with huge shoulder pads (in a more civil war style). So, could this be more 80’s? But enough of this fashion talk, cause it’s the music that matters! The first single “Living On The Run” has a high keyboard content and the chorus is catchy as hell. The voice of Mr. Grönwall is very versatile. He sounds smooth and soft in one sentence and in the following he throws in power and emotion. The guitar solos are always so tasty, you just can’t get enough. The rhythm guitars on the shorter “Falling Down” show an resemblance with Survivor’s “Too Hot To Sleep” album. An AOR album must have at least one ballad, so “ The One And Only” is the first. Smooth harmony vocals can be heard here but Erik is the obvious one and only here! “Better Off Alone” picks up the pace again and is a mixture of great 80’s inspired riffs and hooks with an awesome Erik to top it off. The instrumental break starts with a flashing keyboard solo and is followed by a speedy guitar solo. The saxophone sets the mood in the radio friendly “In And Out Of Trouble”. One of the more calmer songs with smooth harmonies and relaxing guitars. The song goes more in the direction of the Westcoast AOR. Especially the dual solo between the sax and the guitar feeds that feeling! A combination of Richard Marx and Bryan Adams pops up in my head when listening to “I Need Her”. The chorus is extremely contagious. The short but rocking “Heartbreaker” has some of those typical Bon Jovi harmonies in the chorus. “It’s All About Tonight” combines a more sleazy guitar sound with some seductive vocals. A rather surprising song this is, but it makes as always move your hips. The album closer is dominated with keys with a slight proggy touch. The guitars are pushed back here and they give all the more room for Erik’s vocals. But the guitars come back slowly and take over the song. A great composition to close an excellent album! To be honest I was a bit afraid of the new H.E.A.T. with Erik behind the microphone! I thought that the departure of Kenny Leckremo would do harm to the sound. But man, was I wrong! Erik is a different singer, but he has an impressive vocal range and fits perfectly with in the band! Again to delivered an album with great references to 80’s bands like Treat, Danger Danger and other giants but always inject the song with some h.e.a.t.. Any fan of the previous albums can buy this album blindly and won’t be disappointed!